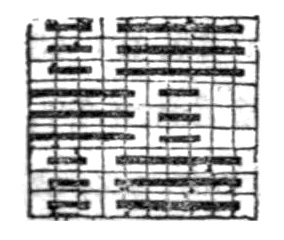 I found the Irish Stitch diagram & discussed while wandering through books on Project Gutenberg (search term ‘needlework’ yielded 7 books) . The Irish Stitch was mentioned in relation to several items on display at Winterthur which looked like bargello but were actually done in Irish Stitch. Irish Stitch.—This is the production of an Irish lady of high rank. Bring your needle up No. 1 over four threads down 41, one stitch back two threads, up 22 down 62, up 43 (observe this is in a line with 41) down 83, up 64 (in a line with 62) down 104, up 102 down 62, up 81 down 41, continuing thus over the square. The spaces left between every other stitch must be filled up with half stitches; for instance, up 81 down 101, up 83 down 103. It is also sometimes worked covering six and eight threads of the canvas at a time, coming back three or four threads, in the same proportion as the directions given. This stitch is proper for grounding, when the design is worked in tent or cross stitch; and the effect would be heightened by two strongly contrasted shades of the same color. It can be applied to a great variety of devices, diamonds and vandykes for example, and many others which will suggest themselves to the fair votaries of this delightful art. It looks pretty, and is easy of execution. 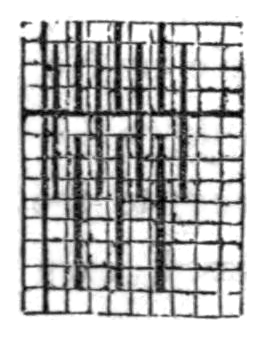 Basket Stitch.—This is the same as Irish stitch, but the arrangement is different. Work three stitches over two threads; these are called short stitches; and then the long ones are formed by working three over six threads, the centre of which are the two on which the short stitches were worked. Thus you must continue the short and long stitches alternately, until you have finished the row. In the next, the long stitches must come under the short ones; and this diversity must be kept up until all the rows are completed. To finish the pattern, you have only to run a loose film of wool under the long stitches on each of the short ones, and the task is done. Project Gutenberg is a wonderful resource!